U.S. Patent #6,344,985, European Patent #1 340 312 and other patents pending. 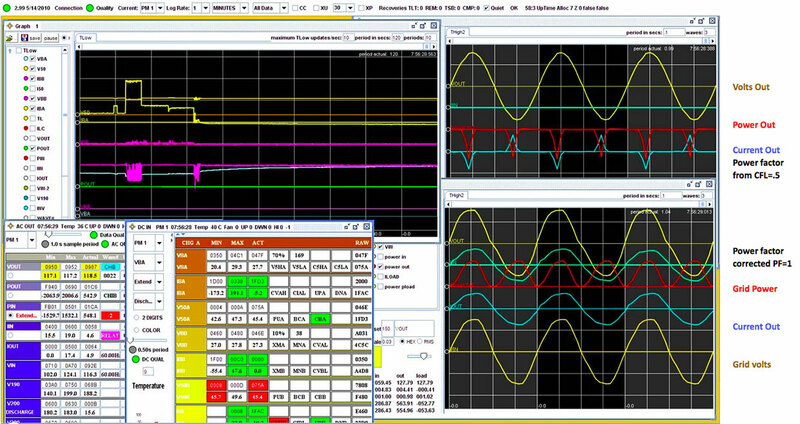 The Transverter system has 2 data streams, a fast oscilloscope level analysis of voltage, current and instantaneous power and scalar values which include true RMS readings of all AC voltages and currents, the power in each AC cycle, all DC voltages and currents on the power modules and 2 temperature readings from the power modules. The complete set of data is updated through the entire system 35 times per second so response is essentially in real time even when it is a complicated decision requiring many variables. Data over 4 days. You can see the red power from solar, the blue power to the battery. You can see the red cycling of the frig and the daily pump.